Well, I’ve just returned from Origins 2012, and it occurs to me that if only I had some sort of blog, I could communicate my thoughts on it. Oh, right, I still have this one. Well, avast me hearties and raise the html, I’ll talk about Origins! This year saw both the Mega-Meta Smithee Awards and the 21st Annual Smithees, and I was honored to help out at both. Many, many clips of terrible movies were viewed, and much fun was had. I’ve been ballot-collecting for the Smithees for several years now, and it was kind of nice to notice that the fans of the Smithees regard me as a regular fixture. When I first started going to Origins, I spent a lot of time in the dealer room playing game demos and then playin games in the open gaming areas. I wasn’t a pirate then, I was just another gamer in jeans and a t-shirt. After a while, I started signing up for games and seminars, and that was fun – it was a nice chance to game with people I didn’t know at all and learn a thing or two about game theory and suchlike. But when I started putting on the pirate outfit (I don’t think of it as a costume now), I found that the best thing to do was to walk around. I know it sounds shallow and vain to say that the best part of Origins is walking around having people take my picture, and that is really, really fun, but that’s not it. I like walking around because it’s my chance to talk to all kinds of people. I love chatting with vendors and gamers and anyone I come across. For some reason people are much more receptive to a pirate walking up and striking a conversation than just some guy. Though make no mistake – Captain Mike loooooves getting his picture taken, especially with people. Which reminds me – Captain Mike needs you…r pictures of him! I don’t have any pictures of me at the con, or pictures of you! Feel free to send some to CaptainMike@CaptainMike.net so that I can remember a little more of what went on. I’m still in a post-convention haze, so some of the finer details are a blur. Arr, it be time t’ batten the hatches and cover the cannons. Hurricane Irene be sweepin’ in, and we’ve got alerts an’ warnings aplenty. But anyway, I’m actually not that worried. I’ve been through hurricanes before, and since I (tragically) don’t actually live on a boat, and in fact live fairly inland, this should be a breeze. A 100mph breeze, maybe, but still. MORE IMPORTANTLY, I’ll be at the Barnes & Noble near Rowan University at 7pm tonight (the 26th), swaggering and mingling. There’s some manner of event or sale or somesuch, and I’ll be adding to the decor. Come on by, it’ll be fun. Well, sails in a metaphorical sense. I am still landlocked – tragic for me but not tragic for those who seek my piratical presentations! But I’m still doing this thing, even though I’ve not updated this site in too long. Even now I have little to say, but I feel like just putting this up will help me get something together for this. In the meantime, put up your feet and have a noggin of rum! Why would I admire pirates? This question was posed to me by a very astute student when I visited her class. The bell rang and she had to hurry on to her next class before I could answer, which was a shame because it was the most interesting and complex question I’d been asked all day. So I’ll answer it here. The answer to the first question is obvious: yes, pirates did some truly horrific things. I don’t just mean that they stole and murdered and raped – yes, those are all terrible things, but there are reliable reports of pirates who engaged in savage tortures of their victims before killing them. These were men who weren’t merely violent, but brutal and sadistic, inventing atrocities and perpetrating them upon a hapless populace. However, there are many reports of pirates who were very civil and good-natured. In one account, a ship that had already been attacked by pirates was allowed to pass – the second group deciding that the ship had suffered ill fortune enough. In another account, a pirate crew went to great lengths to pretend to kill a taken ship’s crew to get a seaman to confess the location of some hidden gold, only to reveal that none of the crew had been hurt at all. The bottom line for many pirates was that violence was a means to an end, and murder for the sake of bloodlust was rarely profitable. It may sound like I’m trying to rationalize the terrible acts of murderers, but I’m really trying to set context. The term ‘pirate’ is very broad – compare it to the term ‘criminal.’ Murderers and rapists are criminals, and so are thieves, but so too are speeders and people who download music without paying for it. This may seem a stretch, but the point is that the term ‘pirate’ was just as unclear a designation as ‘criminal.’ Moreover, compare the actions of most pirates with the actions of most legitimate seamen and marines at the time: attack an enemy ship, kill or subdue the enemy crew, and take whatever was valuable (even the enemy ship itself). The only real difference was that pirates didn’t always worry about the nationality of the ship they were attacking (though sometimes it was very important to them). I admire anyone who’s willing to do what must be done to live free. This is why I generally stick to Caribbean pirates of the Golden Age variety, by the way. At the time, the value of human life was low, especially from a government’s perspective. Sailors and soldiers were paid very little, and when wars ended (and they often did so abruptly), these men had nothing to fall back on. Many people took to piracy because it was a way to earn money, hoping to earn enough quickly enough that they could quit the business and live well. Moreover, many navy sailors were pressed into service – an aggressive version of the draft – and were taken onto warships for years without concern for the man’s previous job or family. Many of these forced men became pirates because they were tired of poor conditions, angered by their indentured servitude, and desirous of worthy pay. Since deserting a navy ship is a crime already, why not get rich by doing so? Seen through the overall historical climate, joining a pirate crew was a legitimate business choice and way of life – it may have been violent and dangerous, but it offered freedom, wealth, and a chance to have a say in one’s own fate. In point of fact, for many pirates, that say in their own fate was the strongest draw. This was an age of kings and queens, with elected government just a cloud on the horizon. Navy captains were chosen from an elite group of trained men, not promoted from the rank-and-file sailors. Pirate crews, by contrast, were democratic. They elected their captains and quartermasters, and even then a captain was only in command in combat. The overall courses and plans were voted on. When the money came in, each man had a share. Captain Roberts later comments in his account that he hoped to never again see any of the pirates unless it was at an execution. This was not a man who had any reason to romanticize these rogues, and yet his account paints, from start to finish, a group of brigands who live by their own laws in an attempt to make a profitable business with as little loss of life as possible. These pirates are not anomalous nor unique – account after account brings up the notion that the average pirate crew wanted wealth and control over their lives, not bloodshed and horror. Is this not admirable? Stephens, John Richard. Captured by Pirates: Twenty-two Firsthand Accounts of Murder and Mayhem on the High Seas. New York: Barnes & Noble, 2006. Print. While it has become downright cliché for a pirate to drink rum (they drank other stuff too, y’know), I do have an affinity for the stuff. I’d like to ruminate a bit about the first rum that made me really think about the drink, 10 Cane. A bottle of 10 Cane. Note that the liquid is only a light tan, not brown. The first thing that caught my eye was the name: 10 Cane, or as it is written on the label, 10CANE. Yup, I checked it out because it looked like ‘Iocane,’ as in ‘Iocane Powder.’ I’m almost certain that this connection wasn’t intended, but then again my friends all thought of it before I said it, so maybe. What you smell is called 10 Cane Rum. It's much tastier than Iocane powder. At any rate, 10 Cane is actually named after sugar cane, and according to the website it takes ten stalks of sugar cane to make one bottle. 10 Cane is made only with sugar, not molasses like brown rum. 10 Cane is clear, with a hint of golden tan. It contains no additional flavors, which is something I love. I have this whole thing about clear rum versus brown or dark rums – it has been my experience that clear rum burns cleaner and doesn’t leave a nasty hangover. Coincidentally, 10 Cane burns very clean – I’ve never had a hangover as a result of it, despite having had about ¾ of a liter over the course of an evening. This is not to say it’s not strong, because it is. It’s 40 proof (80% alcohol, for you new drinkers), and smells and tastes of it, though it is smooth. This is absolutely not a rum for people who don’t like the taste of rum. I’m not a fan of spiced rum – as I just said, this isn’t a rum for people who don’t like the taste of rum, but the inverse is also true: this IS a rum for people who DO like the taste of rum. I can’t drink it straight, but it makes a nice grog (I use a 1:4 rum/water ratio, with a little lime and/or sugar). I also like it mixed with cola, especially Vanilla Coke or Dr. Pepper. When mixed with Mountain Dew Voltage, it’s very sweet and caffeinated and blue. My friend calls it ‘Romulan ale’ on account of how it look like, well, Romulan ale. 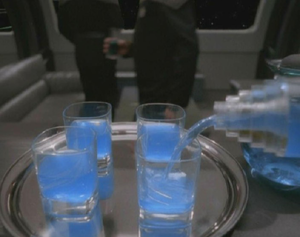 Romulan Ale is blue, in case that wasn't clear from the context. It's very blue. Captain’s log, supplemental: I’ve discovered that there is such a thing as Romulan ale, which is sold at some Star Trek place. I’m not sure why I didn’t think someone had made it. 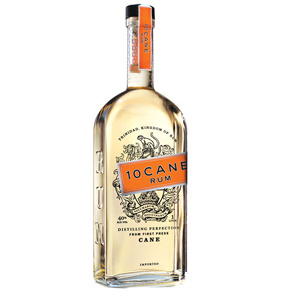 10 Cane was the first rum I’d tried that didn’t have spices or flavoring in it, and I fell in love with it. I haven’t found another rum yet that doesn’t have something else in it – not that I don’t enjoy the occasional belt of Captain Morgan or Sailor Jerry, mind you, but I like my rum to taste like, well, rum! And that’s what a bottle of 10 Cane really is – it’s a bottle of rum, and only rum.